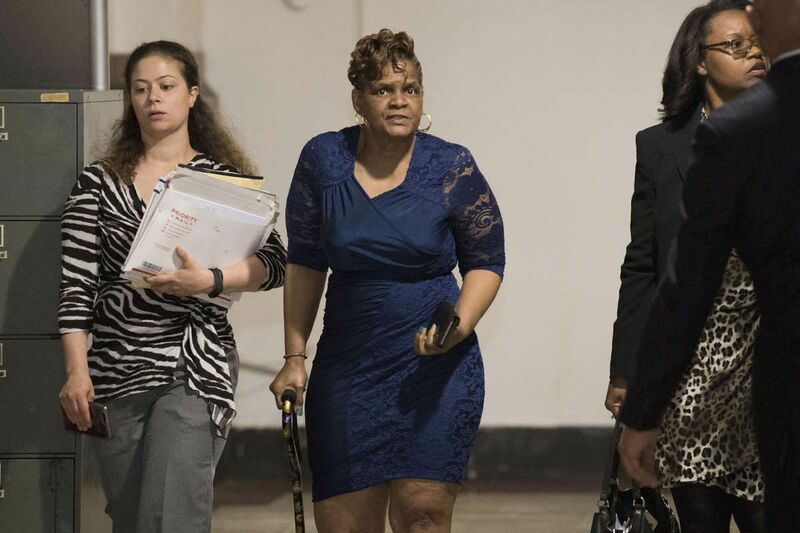 Gloria Byars (center) walks inside Philadelphia City Hall before entering Orphans Court Judge John Herron’s courtroom Monday, May 14, 2018. At right is her attorney, Sharon Alexander; at left is an assistant. A Delaware County woman removed as court-appointed guardian for about 100 elderly clients in the region was berated by a Philadelphia judge Monday for repeatedly failing to follow his orders, being nine months late in filing a report he requested, and failing to show up at two hearings last month. "She has failed over and over and over again to comply with the orders of this court," Orphans' Court Judge John Herron said of Gloria Byars, 57, of Aldan, who has been accused by family members of financially exploiting their elderly relatives. She arrived at the afternoon hearing a few minutes late, walking with a cane. Byars, who has a criminal background of fraud, bad checks, and forgery, was the subject of a March 30 Inquirer and Daily News article highlighting the lack of state requirements, including background checks, for guardians who manage the affairs of people deemed incapacitated. After her convictions became known to Herron last year and the judge learned that she was doling out work to her husband's company without disclosing it, the judge removed her from the 34 cases to which he had appointed her, and ordered her to provide reports of how she had spent her clients' assets. Earlier this year, the other two Orphans' Court judges removed Byars from their remaining cases, as did judges in Montgomery and Delaware Counties. In all, she was removed from about 100 guardianship cases. Monday's hearing dealt with the estate of a former Northeast Philadelphia woman, Estelle Segal, who died in February in a Bucks County nursing home at age 83. Byars, who operated Global Guardian Services in Lansdowne, had failed to file a report of how she had spent Segal's assets as ordered Aug. 10 by Herron and had not appeared at an April 2 hearing to explain herself. Herron, in an April 4 decree, wrote that $127,607 was unaccounted for in Segal's estate. He sentenced Byars to five months in jail for contempt of court, but suspended the sentence pending Monday's hearing. On Monday, Byars and her attorney, Sharon Alexander, told the judge they would immediately file a final account of Byars' expenditures. They said Byars had missed the April 2 hearing and another on April 24 because of illness. Herron's threat of jail time remains pending the outcome of a June 6 hearing to review Byars' expenditures in Segal's estate. After Monday's hearing, Byars and Alexander declined to comment. The April 24 hearing was to explain disputed expenditures in the estates of a former Fox Chase couple, Edmund and Margareta Berg. The judge Thursday issued a decree ordering Byars to pay $63,079 — in part to reimburse the Bergs for $34,113 in improper expenditures and $4,487 in guardianship fees she paid to herself, and to pay $24,479 in legal fees and costs incurred by Margareta Berg's brother, Josef Wituschek. In a harshly worded opinion Thursday, Herron wrote that Byars' "misconduct ranged from mismanagement of the estates of her wards in the best of cases, to misappropriation of their assets in the worst." Herron also lambasted the Philadelphia Corp. for Aging, which had recommended Byars for most of her city guardianships, writing that "the court is deeply disappointed in PCA and disturbed by its lack of due diligence in examining the history and fitness of [Byars] to serve as guardian before nominating her." Added Herron: "PCA's utter failure to conduct even the most elementary assessment of [Byars'] fitness to serve resulted in her appointment to nearly all of her 91 former cases in Philadelphia." He added that although Byars "is only one bad apple, that one bad apple has imposed an astronomical administrative burden" on the court's small legal staff, which has "had to go to extraordinary lengths to remediate her misconduct and find suitable successor guardians for each ward." The agency's lack of vetting of Byars "has shaken the public's faith in the guardianship system," Herron wrote. Byars has not been criminally charged in any guardianship cases. Herron wrote in his decree Thursday that the matters of the Bergs and Segal "have both been referred to the district attorneys of Philadelphia and Delaware Counties for appropriate review." Unlike 18 other states, Pennsylvania does not require professional guardians to undergo criminal background checks, although the revelations of Byars' fraudulent past have spurred some changes. In Philadelphia, guardians now must affirm that they have not been convicted of any crime involving fraud, deceit, or financial misconduct. Also, an individual or agency, such as PCA, now must submit a Pennsylvania State Police criminal history report for a proposed guardian. And if the guardian resided within the last five years in one or more other states, a criminal history report from each of those states is required. The petitioner also must submit a statement of the guardian's certifications, caseload, and counties where the guardian has served. The new city requirements are similar to proposed changes recommended in December by the Pennsylvania Supreme Court's Orphans' Court Procedural Rules Committee to the Supreme Court justices, who would decide whether to adopt them statewide. Changes also are being proposed in the legislature. State Rep. Mark Gillen (R., Berks) on April 9 introduced a bill requiring criminal background checks for prospective guardians and prohibiting felons from serving. State Sens. Art Haywood (D., Montgomery-Phila.) and Judith Schwank (D., Berks) are working on a Senate amendment to another bill to require background checks and certification for guardians. "The court sincerely hopes that the discovery of [Byars'] malfeasance will serve as a clarion call to make the larger changes necessary to protect incapacitated Pennsylvanians," Herron wrote in Thursday's opinion. Abbey Porter, a PCA spokeswoman, said in a statement Monday: "PCA acknowledges the court's new procedure concerning its appointment of guardians … [and] endorses the position that criminal history is only one of the criteria that may be relevant to the screening of potential guardians, and looks forward to its role in the development of these standards."